CCF recently updated our Snapshot of Children’s Coverage by Race and Ethnicity. The updated fact sheet includes the percentage of children residing in each state by race and ethnicity and the percentage of children covered by Medicaid and CHIP in each state by race and ethnicity for the year 2016. 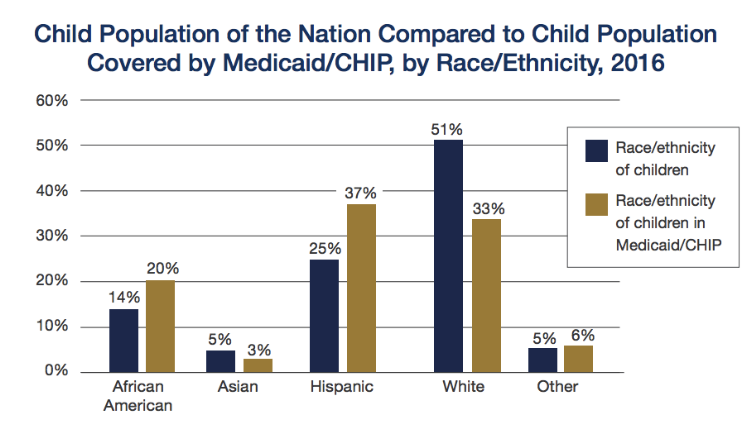 The snapshot shows how Medicaid and CHIP are particularly important for children of color, who are disproportionately represented among enrollees because they are more likely to be economically disadvantaged. We previously wrote about a study that found racial and ethnic disparities in accessing mental health care for children between 2006 and 2012. Visits to mental health professionals were 68% lower for African American young adults and 62% lower for Hispanic young adults when compared to visits for white young adults. A new study in the Journal of Public Health Research analyzing data from the 2011/2012 National Survey of Children’s Health finds evidence of racial and ethnic differences in health insurance adequacy and consistency among children. The authors defined health insurance as “adequate” if the insurance usually covered the services necessary to meet the child’s needs, allowed the child access to needed providers, and there were reasonable out-of-pocket costs. Health insurance was considered “consistent” if the child had coverage over the last year without being uninsured for any amount of time. (For more information on these definitions, see the full report). There were several notable findings from the study. Black and white children living in households below 300% FPL were less likely to have adequate coverage than children living in households at or above 400% FPL. Similarly, Hispanic and white children in poorer households were less likely to have consistent coverage than children living in households at or above 400% FPL. Also, older children were more likely to have inadequate health insurance than younger children. The authors also find significant connections between maternal health and children’s coverage. Hispanic and white children who had mothers with “poor” mental and physical health were less likely to have adequate coverage than children who had mothers with “good” or “excellent” mental and physical health. Furthermore, Hispanic children with mothers who have “poor” mental and physical health were less likely to have consistent coverage compared to Hispanic children with mothers in “good” mental and physical health. The findings on children covered through Medicaid and CHIP will be of particular interest to Say Ahhh! readers. Children with public coverage were more than twice as likely to have adequate insurance than children with private coverage. Though not included in the study, we believe this result may be due to EPSDT. However, children with public coverage were also less likely to have consistent coverage, a sign of possible churn. The authors conclude that to improve adequacy and consistency of children’s coverage, policies must address the struggles of economically disadvantaged families.